Amongst our usual boat charters which include; Crew Transfers, Guard Boat Duties and Dive Support we also undertake a number of different Safety Boat jobs across the country. CRC Hercules was mobilised to Dover earlier this year to provide 12 hour safety boat support for the ongoing Dover Western Docks Revival Project. She is due to be onsite for the next two years working every day, and thanks to the CRC mobile workshop and in-house engineers this can remain a possibility. 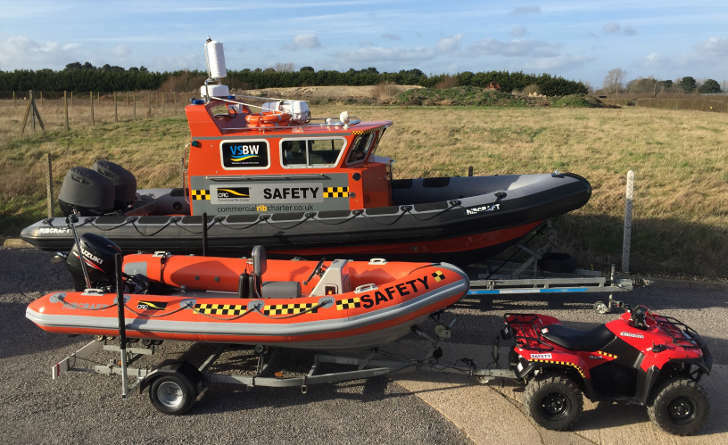 Our Smallest Safety Boat ‘CRC Gnat’ spent the first part of the Summer on standby down on the sandy beaches of East Sussex, ready to spring in to action should any of the vessels or crew involved in the nearshore dredging works need any assistance! With more and more demand for these conspicuous brightly coloured craft, new CRC boats are on the way, so watch this space for more information soon. Thanks to the wide variety of boats in our fleet, we have the ability to provide safety boats in any location, from lakes and rivers to offshore construction sites. ← Seawork ’17 – A successful show.